From Burning Man Festival in Nevada to Sunny Seville in Spain; this is the story of Azadeh and Arjun's four-wedding adventure. A surprise proposal in Japan led to Arjun and Azadeh's stunning wedding celebrations in Spain. 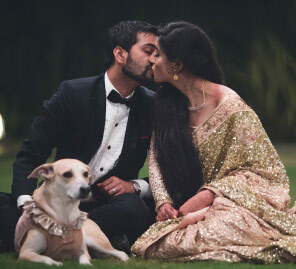 Here, the couple shares how they planned a heady traditional Sikh wedding that included many fun and memorable elements. Azadeh and Arjun first met in December 2009 at a mutual friend’s birthday brunch in Dubai. “I have a vague memory of Arjun fumbling for words in broken Italian to impress me when we first met. We were really good friends for five years and were part of a very intimate group of single friends called Kaleidoscope that hung out every weekend and traveled together,” shares Azadeh. Currently, Azadeh works as an interior designer based between Dubai and Lisbon, and co-founded the Roshan Group, a design studio and interiors company. Arjun is a New York-qualified corporate attorney and partner at Argentum Law. He is also a white-collar crime investigator and diligence specialist with the Vienna-based International Anti-Corruption Resource Group. “We traveled to 16 European cities in 20 days in July 2015, spanning Copenhagen to Rome before deciding on Andalusia. My most memorable childhood memories were of spending summer holidays driving around different regions of Spain. I remember feeling a connection to Andalusia. Maybe it was the strong Eastern architecture and influences in a Western setting. When I went back with Arjun, I fell in love with Seville all over again, and the nostalgia and happy memories came rushing back,” shares Azadeh. The couple traveled all the way over from Dubai to be married in the Black Rock Desert, Nevada at Burning Man. The ceremony was held at the Mazu Temple and luckily no one else had planned their ceremony at the spot and time as the couple did! There were two other ceremonies in other parts of the temple and one looked like a Dothraki wedding out of Game of Thrones. 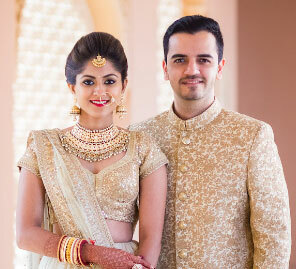 The couple rode to the ceremony on bicycles as Arjun wore an outfit that perfectly matched with the theme of Persian Princesses and Indian Maharajas and Azadeh adorned a mini skirt sari by designer Reema Ameer paired with Nike wedges customized in the same hand embroidered fabric. The bride was holding a transparent box clutch with a pouch that had embroidered ‘baleh’ on which translates into ‘yes’ or ‘I do’ in Farsi. She also added ‘eek onkar’ which translates into ‘one supreme reality’ in Punjabi. They exchanged rose gold wedding bands from Vik Jet Fine Jewellery, and Azadeh wore a headpiece and earrings given to her by her mother-in-law. 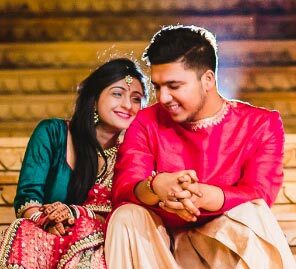 The inspiration for their wedding was their cultures and having traveled together across India, Iran and 21 different countries. They also used elements that inspired them in their travels so far. “A colorful Punjabi village and market with stalls of snack, popcorn and ice-cream, bangles, bindis, handmade dolls, 'kaleeras' (bridal wrist danglers) and other giveaways were arranged. We also had a colorful rickshaw and an Indian tractor-art as our bar. An authentic looking bar menu that looked like it came straight from the Punjab with the typical funny English misspellings and drinks like “Jin” and “Wiskee”. A ceiling of Jaipuri umbrellas and stringy fairy lights covered the area. For the ceremony, we had strings of pink and white roses hanging from the gold-painted wooden structure I had built to respectfully cover the Sikh holy book." Azadeh was born aloft a minimalist wooden 'doli' (palanquin) that was festooned with garlands and carried by four men. The Iranian ceremony took place the next day in the Moorish-style Villa Luisa, a touch of Persia in Seville, followed by a Spanish feast and party at the historic Casa de Pilatos. The couple flew to Ibiza the next day with 30 of their friends and partied like rock stars for four days non-stop. Arjun and Azadeh then flew to Bologna and road-tripped through Tuscany and Emilia Romagna, before flying to Lisbon. 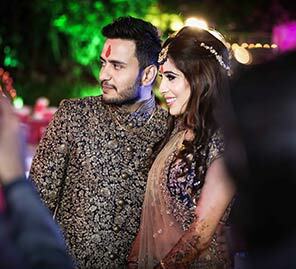 Azadeh Roshan and Arjun Ahluwalia's 500-guest reception took place in the garden of Arjun's parents' home in Jumeirah, Dubai. It was organised by Arjun's mother, a wedding planner. Azadeh is wearing a Sabyasachi lehenga with a headpiece and earrings from her mother's heirloom pieces. Arjun wore a ivory suit by Sartor, with blue Jodhpuri-style pants to match Azadeh's look. 1. Choose your wedding planner carefully. 2. No planning is enough planning, but on the day, just let go. 3. Have moments where you step back to observe everything and take it in before it’s over - it all ends way too quickly. 4. Change into a more comfortable dress or at least shoes! 5. Get a massage & a facial the day or night before, especially if you’re partying till the wee hours! Wedding Planner: Stratezen Events and Indira Anzola for D-Pleis Events.